I am new to the forum. 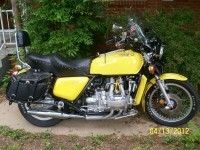 Got my first 1982 Goldwing two weeks ago. She cranked when I went to view the bike. After finding corroded fuse box and starter solenoid (30amp DOGBONE FUSE) I am closer to a crank. A warm welcome and grats on the "new" Wing. Keep us posted on your progress.